After the gigantic forcola post, I thought "what better theme to follow up with than tiny gondolas?" Ok, so they're not tiny by most standards, but they are much smaller than the standard ones which measure out at 11 meters/36 feet long. 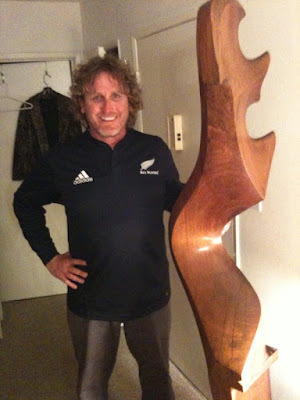 Andrew McHardy discovered the enormous oarlock, I've gotta give credit to Tamas Feher for finding these two gems. They're on the Flickr website in the Arzana collection (in the Squero Battistin section). then come back and give us your best little puppy-adoring "aaaahhh" - kind of like my daughters do when someone walks by with a newborn baby or a box of kittens. d. how many are there and where are they? 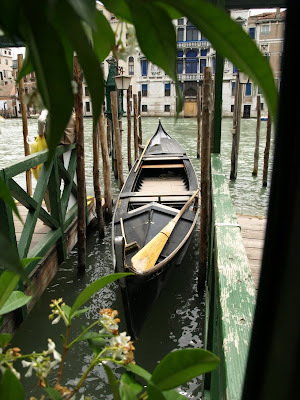 Within the gondola world, a lot of people know of them, but hardly anyone has actually seen one except in photographs. A half-size gondola is an unusual creation. Measuring somewhere under twenty feet in length, and quite narrow, they make amazing showpieces. And while they are much smaller than standard gondolas, they are still longer than your average four-door sedan - not something most wives will let their husbands display in the living room. Small boys (usually the sons of gondoliers or boat-builders) would row them while dressed in traditional clothing. 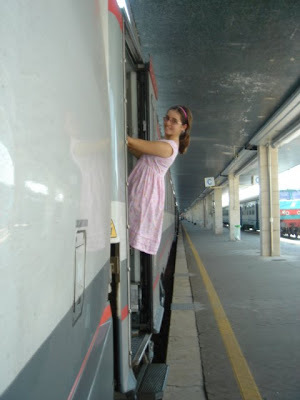 Other children would ride inside as passengers. I'm quite certain that it was the cutest darn thing most Venetians would see all year. I'll bet they made those same puppy-adoring sounds my daughters make. 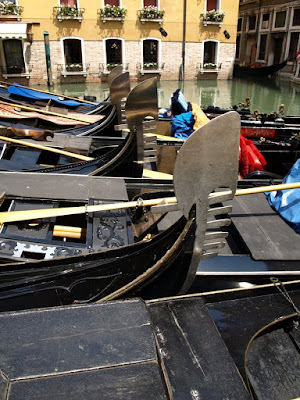 Most half-size gondolas are quite old, the Tramontins built a handful of them in the early 20th Century. Squero Casal also produced some. 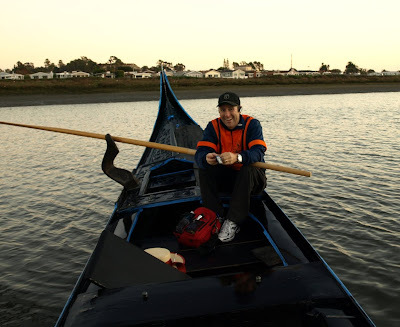 Gilberto Penzo's full-size hardback "La Gondola" has a small photo of one being rowed on the lagoon - the boys are in full parade dress and the boat actually has a felze top as well. The ones in Tamas Feher's links were built by Squero Battistin. The most recent one I know of was built by Thom Price about eight or nine years ago. It was the only one he built and he did it in a friend's home while on vacation in the U.S.
As unique as these pint-sized boats are, their applications are extremely limited. Aside from museum display and parade use, there's not much else they can be used for except in private collections or maybe as decarations at Italian restaurants. 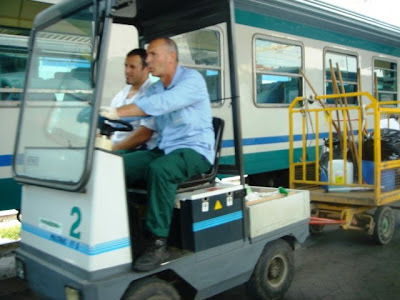 I don't know if they are half as wide as a standard gondola, but judging from the photos I've seen, they are still too narrow to take adult passengers sitting side-by-side. In a community of jockeys maybe, but still, from a stability standpoint, I'd be leary to risk it. One hard lean to starboard and the serene romantic cruise could immediately transform into a spontaneous swimming-lesson. The one thing a half-size gondola can do though, is separate the "gondola fanatics" from the rest of the population. When a bunch of people walk into a room and encounter one of these diminutive boats, most of them will just say "hey, I think that's one of those boats from Venice". But the true "gondola fanatic" will be shocked, amazed, he or she will immediately fall in love with the boat, silently thinking of ways to try and smuggle it out in their coat. Too small to row, too big to pick up and walk off with. And one of the cutest things I've ever seen. and such, eventually leading up to the photo way down the page, but it seemed to me everyone would invariably scroll down and see the photo first. After some consideration, the above title was simply unavoidable. If you haven't scrolled down yet, get ready to be shocked...and now look at that enormous oarlock! I showed up the other night for the event at Sunset Gondola, and Andrew and Tim couldn't wait to show me this photo. As Tim put it: "no build-up would be too much". I thought to myself "what could possibly be worthy of such an introduction?" Andrew Mchardy was visiting a friend named Jason Bissell in North Hollywood, when Jason said something along the lines of "You've got to see this, you're not gonna believe it!" 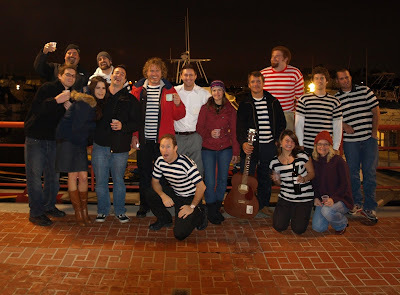 Jason has the unique distinction of being one of the only gondoliers ever to have actually been fired from the operation in Alamitos Bay. Tell that to a bunch of boisterous gondoliers on a pilgrimage to Captain Jack's and they'll raise a toast to the man. Jason lives in North Hollywood next door to a German woman who is about to do some vacationing. A while back she asked him if he wouldn't mind watering her plants while she was out. He agreed, and walked into her place only to find the biggest freakin' forcola anyone's ever seen, just standing there and serving as a makeshift coat rack! After expressing his amazement, his neighbor told him that it was a gift from the actor Anthony Quinn. It turns out that Jason's neighbor dated Anthony Quinn, and while he was in Italy (probably working on a film), Quinn sent her this gift. Yes, it's made of real wood - the type yet to be determined. No, I don't know who carved it as of yet. Yes, it does appear to be modeled after a forcola da pupparin. and NO, Andrew is not a midget, the guy's six feet tall. The forcola really is that big. So that's what we know so far, but rest assured I'll be making my way up to North Hollywood some time soon to see this Paul Bunyan sized forcola for myself. No, this isn't an April Fool's post. I wish I could be creative enough to come up with something like this, but sometimes the truth really is stranger than fiction. "Sunset Gondola hosts another excuse for gondoliers to get together, drink wine, tell lies, and laugh a lot (and really loud)". Pictured from left to right: Ian McCabe, Eric Sjoberg (toasting), Heather Aldridge, Peter Dever, Greg Garite, Andrew McHardy, Greg Mohr (kneeling), Dan Devine, Rachel Grizzel, Tim Reinard, Charles Green, Erin Grissom (kneeling),"Rotto Sorriso", Dawn Reinard (kneeling), Kelly Armstrong. Last night a bunch of us got together once again at Sunset Gondola. This was the 5th one of these shindigs hosted by Sunset. I must give Tim a great big "thank you" for putting these things together - they are so fun. The formula isn't rocket-science, you just get friends together, add a little food and wine, then throw them all on boats for a row to a local haunt. Having guys like Sjoberg and Andrew there certainly helps keep things fun and interesting. But I think the secret is that everyone likes each other. They look forward to the company; to the rare chance to just "hang with their own" as gondoliers and gondola people. Everyone must also like Tim, cause he's the one who calls them up and invites them. As usual, I met some new friends and enjoyed visiting with established ones too. I had a great time catching up with Erin after her long odyssey in Europe. Greg Garite, Heather and I chatted for a while about Las Vegas gondolas. 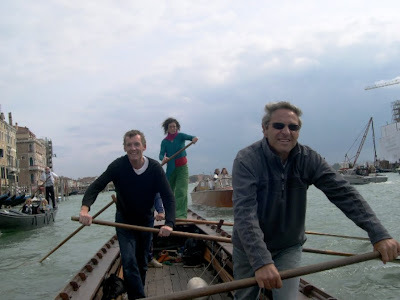 Pete and Andrew pulled me into a conversation about the various "boat families" in the Venetian lagoon, and Eric Sjoberg was the boisterously funny guy that he usually is. There were other exchanges between the folks there that I missed, but they all enjoyed themselves. I wish I could have spent more time talking with everyone. Usually I spend a fair amount of time creeping around with cameras and trying to capture moments. This time I decided to just settle in and enjoy the company of friends and I'm glad I did. I wasn't able to join in the procession this time, and it sounds like I really missed out. The light on the water, with current conditions made for a sublime and surreal experience to and from Captain Jack's. I've been told that Andrew McHardy sang one of the "best versions of 'Po-pay' ever heard". All in all, Tim Reinard described the event as "one of the best ones yet". I returned from a family trip to Washington DC to find some cool things in my inbox. Among them, a fresh photo from Ina Mierig in Hamburg. 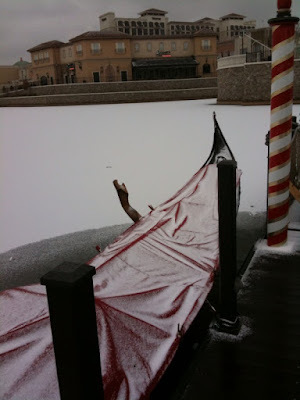 Some gondoliers have the opportunity in winter to step where they usually row. 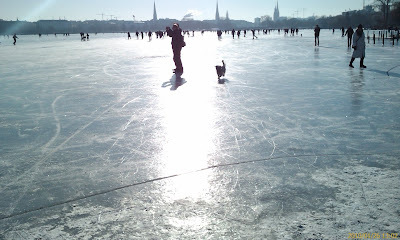 Ina went for a walk yesterday with her sister and her dog to tread on the frozen Alster - a tributary to the Elbe River. The Alster meets the Elbe in Hamburg, and all that water, which Ina rows on, joins water from other parts of Northern Europe to eventually flow into the North Sea. "It is the first time after 12 years that you can stand on the Alster. It was big fun." As you can see from the photo, they weren't the only ones out on the ice - looks like lots of folks took time off on a Tuesday afternoon to enjoy the experience. Hamburg is Germany's second largest city and a hub of activity for Northern Germany. In the distance you can see some of the high steeples which are so distictive for the region. Thanks for the report Ina, stay warm! 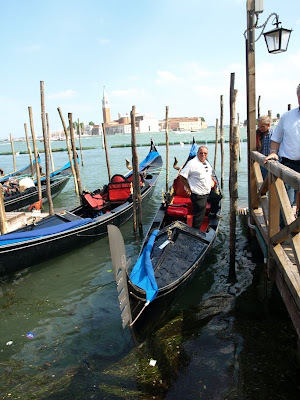 When you arrive at Bacino Orseolo in the very early morning, the place is jammed with gondolas. Later on, after many of the boats have gone into service, the "raft" dwindles down a bit. Here are a few shots I took when there were only 15 or so gondolas there. The way the gondolas fit together there is both confusing and pleasing to the eye. similar in some ways but each one as unique as the boat it was attached to. Each one different, and yet unmistakeably "gondola". For those of you huddled-up for winter, here are a pair of photos I got from Tirza and Hans in Amsterdam. They were taken in a warmer season last year during a row in Venice with friends from a rowing club based on the mainland. I am, I'm freezing my tail off in D.C. and watching news stories about wicked storms back in my Southern California hometown. I guess I should ask my So Cal friends - is it really that bad right now? 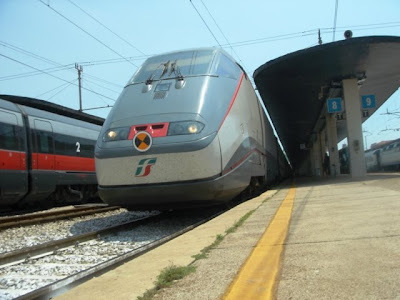 For many who visit Venice, the first and last part of your time there is spent at the train station. It's not bad as train stations go - nothing like the full-canopied ones you see in spy movies, but it does the trick. Here are a handful of shots I took at the end of my last visit. 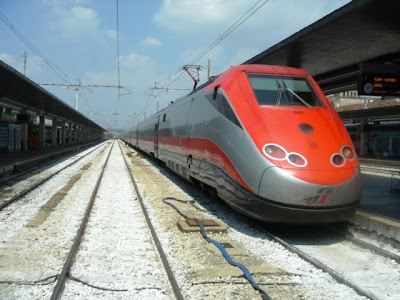 Some of Europe's trains are more jet-like than the choo-choos that first brought passengers to Venice. 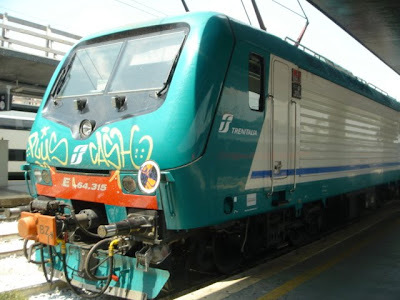 Here's one of the more utilitarian workhorses of the region. As you can see, it's been tagged by somoene who obviously thought it should have "plus cash" emblazoned on the front. One of my daughters re-enacting something from one of her books. The guys who keep things in order at the station. 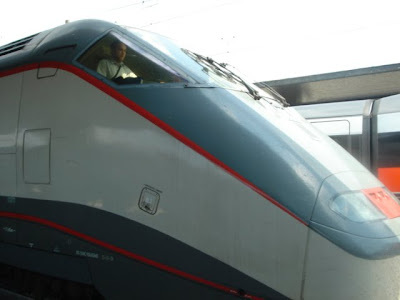 The "pilot" of our train in his "cockpit", getting ready for takeoff. 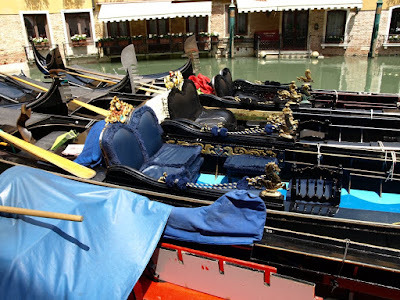 Among the many gondolas rafted-up in Bacino Orseolo, I saw one boat with blue seats. You'd think that dark blue would blend in more, but with such black uniformity, the blue stood out. The gondola also had unique floorboards and the decorative rope and pom-poms which trail behind the cavalli matched the blue upholstery. It seemed like a pretty safe bet that this one was privately owned. Taking a closer look, I noticed some nice carved fodra boards (removable panels just below the rail inside) and an impressive scimier which sat atop the seat back. It's nice to see a gondola that is clearly prized by her owner. And there are a number of them in Bacino Orseolo. Generally speaking, Southern California has some of the most pleasant and gentle weather around, but now and then we see anomalies. Tim at Sunset Gondola witnessed "weather with a twist" today and posted some photos on his blog. Check out his post The Twister of 2010. I passed by the assemblage of gondolas near the Giardinetti near San Marco and had to whip out the camera. Since the invention of the camera, this place has been rather popular with photographers, and understandably so. With the small Isola di San Giorgio Maggiore in the background, and the column of ferro blades which rock up and down with the movement of the water, this spot has mesmerized (some would say hypnotized) many a visitor. I noticed a certain uniformity in the blue canvas on these boats. 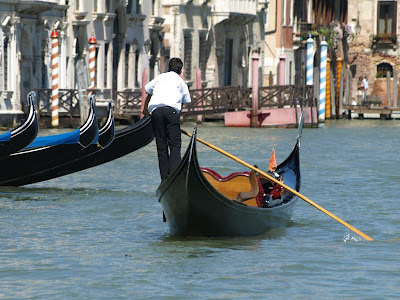 Some are a little older than others, but there's more consistency there than in most other places where gondolas are plentiful. As is common in Venice,this guy does the "roll to one side" rather than hassle with removing the canvas. I noticed that his bow-deck was fully carved, indicating that his was a wedding gondola. It was that same look I got at the produce boat! You think this guys is as annoyed with me as that produce guy? I swear, all I did was take pictures. 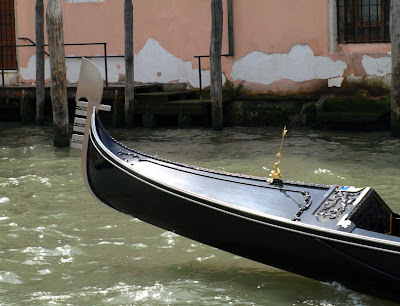 More and more I've been noticing the presence of black hose-like things used on gondolas to serve as qasi-fenders. Sometimes they're black hoses, sometimes bicycle tire innertubes - I just call them hoses. This guy, has taken the whole hose thing to a new level. The fending method is clever but I wonder if his sister has noticed yet that the tires on her pink bicycle are missing along with the inner tubes. Take a closer look at the clipper-ship painted on on the portela of the gondola next to it. Interesting deck carvings too. I might be mistaken here but I could swear I just hear a whole bunch of barking and meowing outside my window. Yep, it's officially "raining cats and dogs" out there. I checked my web-counter and by the look of things, a lot of you are holed-up inside and waiting out the storm. I hope my musings are at least somewhat engaging. You must check your boats. Pretty soon I'll be suiting up in my best waterproof attire and firing up my favorite shop-vac. After that I have a feeling I'll spend a little quality time in front of the fireplace with some red wine. Just the Photo - "Big Empty Blue"
Photo taken in Newport Harbor, Spring of '09. 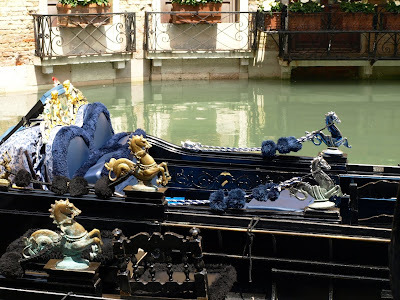 Because there are so many gondolas jammed into Bacino Orseolo, it's easy to spot the different details that make each boat unique. Earlier this week we saw a highly polished ferro, today we see the oposite. My guess is that this ferro has been around for a long time, and probably has some sentimental value. If it could talk, I'm sure this ferro would tell a long and interesting story. while others claim that it's not a color at all. Some say that black is the presence of all color. Others believe that black is the complete absence of color. 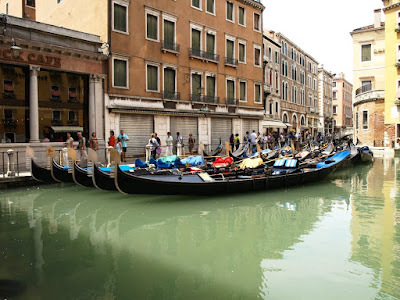 I think the options above may each have merit depending on the situation, but in the case of the Venetian gondola, the reason that gondolas are black began as an "absence of color". 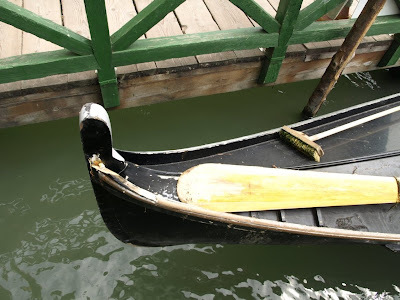 There are a number of incorrect theories behind the reason Venice's gondolas are black. Some of the more mainstream falsehoods include some sort of mourning. I've heard a number of people claim that they are black to mourn the fall of Venice at the hands of Napoleon. 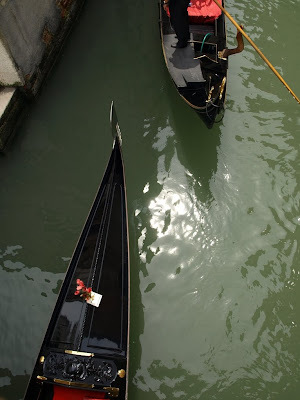 Others have said that Venice's gondolas are painted black to mourn those who died in the plague, and I've also heard it said that they are black because they were also used as funeral barges during the plague. These are all interesting theories, and most of the false statements about the gondola could conceivably be true, but the truth is that there was no paint-color mandate - it was a mandate against paint. 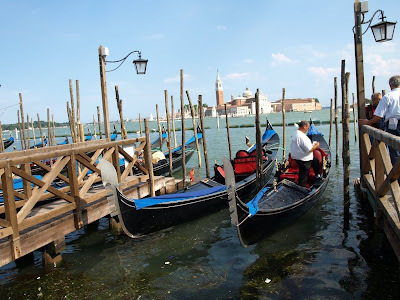 For the longest time gondolas were the "private coaches" of the rich and powerful of Venice. Not surprisingly, these follks spent a fair amount of attention on looking good, which included dressing up their gondolas. How a well-to-do Venetian appeared to his neighbors was important to him. Great wealth was poured into each gondola. A little healthy rivalry can be good - it keeps people on their toes, makes them strive to be better, but at some point things got out of hand, this Venetian version of "keeping up with the Joneses" ended up on the radar of the city fathers. The more these high-profile Venetian families tried to outshine each other, the more money they dumped into the competition. It seems that what had begun as a harmless beauty contest, developed into what the leaders of the city called an "unecessary financial expense". In order to curtail these unnecessary expeditures, a decree was issued in 1633 prohibiting many things including the practice of painting a gondola. As a result, they ended up black (as boats were waterproofed with pitch back then). Many refer to the this Venetian ruling as a "sumptuary law", akin to those issued in the days of the Roman Empire. Most of the Roman sumptuary laws revolved around clothing and were put in place to reinforce social hierearchies (by the rich, to control the not-so-rich). The Venetian law of 1633 was different: it had been put in place to control the rich. There are some who are quick to point out, however, that the government's boats were exempt - giving them the ability to outshine the regulated boats. Because pitch was used in the waterproofing process in the 1600's, an absense of paint meant that the boats would end up black. At some point black paint worked it's way into the mix, and even though the sumptuary law was meant to curtail the beauty of these boats, it really just brought about a new kind of beauty. Before that time, gondolas in Venice were ridiculously well decorated. Adorments of gold and other expensive materials literally hung from the boats. Brightly colored paints, which were a show of wealth as well, were used to outshine other boats. 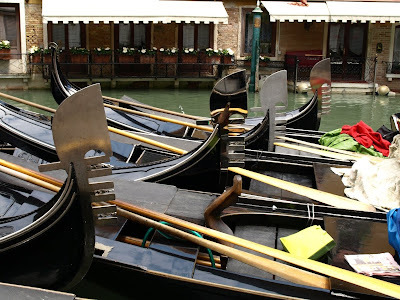 I'm told that ferros and other metal elements on the gondolas were sometimes made from pure gold. This was all far from utilitarian, but on the Grand Canal it had become a priority to dazzle everyone. The gondola today has a much more classy, understated beauty - one that doesn't scream out like a candy-apple red hot rod, but rather simmers with the seductive allure of a black Maserati. It's a beauty that comes with confidence and inherent grace. 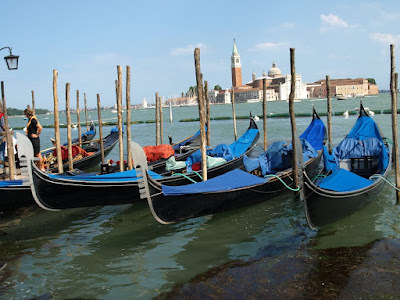 As I have obsessed over these boats for many years now, maybe it's conditioning, but I can't think of another color more perfectly suited to the Venetian gondola. Here's an interesting short piece on the restoration of Venice's former Doge residence. It's an AP article, compliments of Yahoo. I may have been imagining this, but the last time I was in Venice it seemed like there were a lot more dogs. For the longest time it was the cats who got all the attention. In fact I remember 12 years ago when I came across an agency solely dedicated to facilitating the pet-adoption of Venice's stray cats. I've seen dogs in Venice during previous visits, but last June it seemed like there was a dog around every corner, one or two on every vaporetto, and each time I ventured into a campo, there were several folks there with their canine pals. Most of the dogs I saw were with their owners, but I did see a few that might have been strays. There was another thing I encountered a lot this last trip out to Venice: yep, you guessed it - dog poop! Holy moly! It seemed like it was everywhere! Has anybody else noticed a dog increase in La Serenissima? The Hotel Cavalletto (yes, that yellow building you see in so many Orseolo photos), is actually a Best Western! 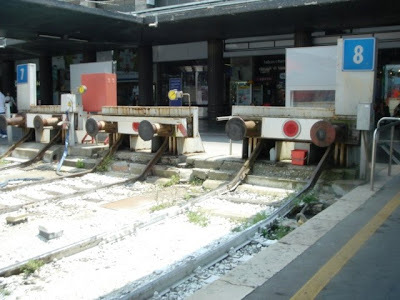 As much as I love moving about Venice by vaporetto, an even more Venetian way to cross the "Canalazzo" is by traghetto. Venice has four bridges that allow one to cross the Grand Canal (for the longest time there were only three). Oh, but there are many other spots where you can get across that backwards "s" shaped waterway, and they are called "traghetti". 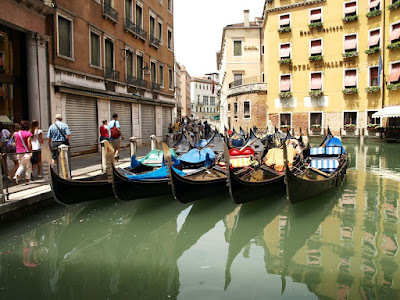 A traghetto is a sort of "gondola ferry", which is rowed back and forth from one side of the canal to the other. The cost is negligable - I don't want to commit to an actual number because it fluctuates, but suffice to say that it's a small handful of coins, and for most Venetians, a worthwhile short-cut and a great time saver when compared to finding a bridge to cross. While waiting for the traghetto at San Toma with Nereo and Martina Zane, I shot these photos of another traghetto boat which was docked and waiting for busier hours. The traghetto has been described by some as "an old retired gondola", but most of the ones I've seen are wider and heavier than gondolas. 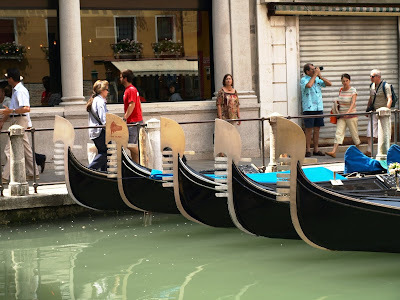 They resemble gondolas, in that they are rowed like them, and are painted black, but they're typically more robust in construction and can handle higher passenger counts. 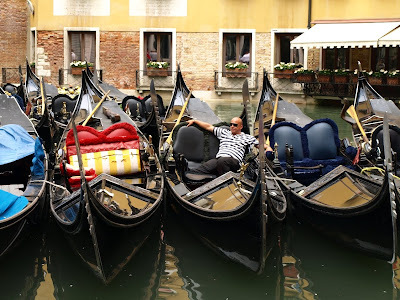 Walking by Bacino Orseolo, I noticed this gondolier takin' it easy in the afternoon. 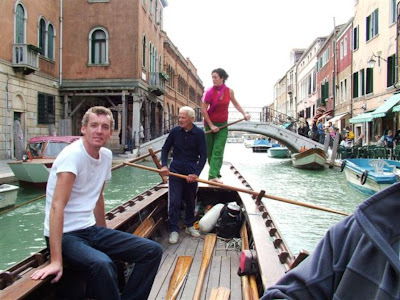 As natural looking as it is to see a gondolier up on the poppa (rowing deck), it seems like a contradiction to see one seated in the passenger area. "It is a socialist idea that making profits is a vice. I consider the real vice is making losses." Ok, so the quote has nothing at all to do with the kind of vise we're talking about today. But it really is a great quote, and I knew I needed at least one Churchill quote before my blog could be considered "respectable". Churchill is like cowbell - you can never have too much of either. The term "vise" or "vice" should probably be explored briefly. In the U.S. and Canada we refer to sinful things, addictions and guilty pleasures by the term "vice". The squeezing and pinching mechanism, which is usually employed to hold things in place is a "vise". In the UK and Australia "vice" covers both meanings. I have no idea how the rest of the english speaking world differentiates between the two. 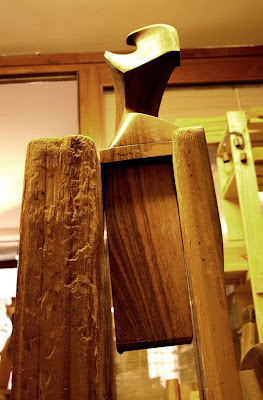 Here are a few photos I shot in Franco Furlanetto's shop of two separate vises. As the remer works on both forcole and remi, invariably he needs something to hold an item in place while he goes to work with a variety of tools. A vise is the obvious choice for most applications, and not surprisingly, Venetian remers have their own version. Known as "la morsa da remeri", this gripping element is hard-mounted to the floor, has vertical jaws, and can be quickly opened and closed using a large "nut". 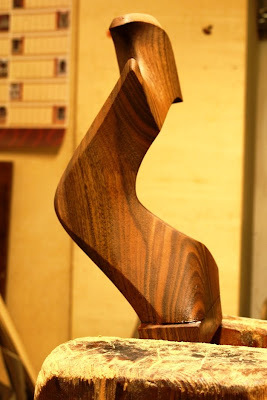 Often the piece being worked on is also supported or held in place using cavalletti and other impliments. 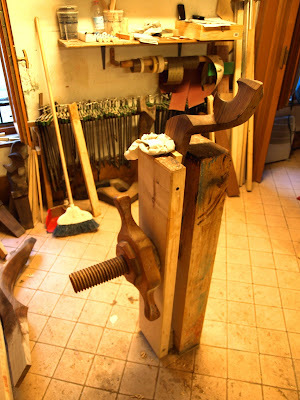 In the remer's shops I've visited, a vise is usually either in the center of the room or close to it. 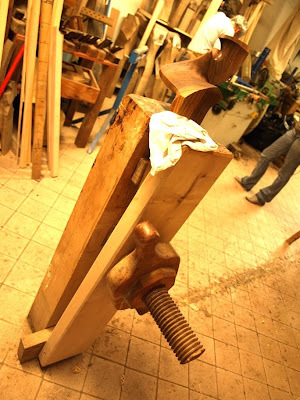 Much of the work associated with bringing a beautiful forcola out of a plain chunk of wood, takes place while the wood is clamped in the vise. In order to keep the vise from damaging or leaving marks on the piece, the jaws are made of wood as well. 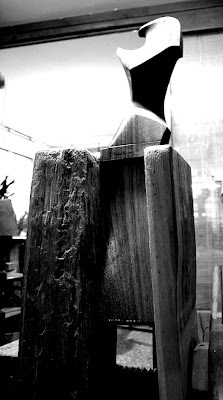 Through time and use, that wood gets worn and scarred. Gilberto Penzo has published a number of great books over the years. The book "Forcole" is a great pictorial in which he collaborated with the famous remer Saverio Pastor. Some of my very favorite images in the book feature Saverio Pastor "getting physical" with the forcola in the vise and demonstrating how necessary it is to mount the vise to the floor. I love taking pictures in Bacino Orseolo. and there's no place in Venice like Orseolo. 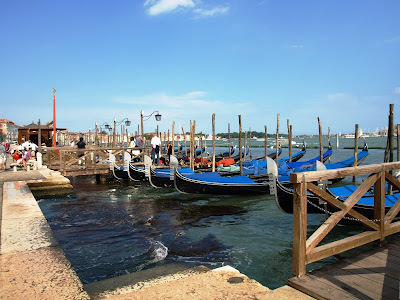 Known as the "gondola garage" by some, Bacino Orseolo is not only a place to get on a gondola for a ride, it's also where numerous gondolas can be seen rafted together. As you've seen in previous posts, this raft of gondolas makes for some fun photos. I dare say that it's next to impossible to walk through there with a camera and not take at least a few pictures. Today's Orseolo photo shows a grouping of gondolas criss-crossed bow to stern. It looks like someone got a new ferro. Or maybe just got finished polishing the heck out of it. Either way, it sure looks nice, and stands out in a big way. That blade is so shiny, that in a previous photo, you can see my reflection in it as I crouched to take the photo. I decided not to post that image because the reflection of some bonehead tourist crouching down seemed to detract from the the quality of the scene. 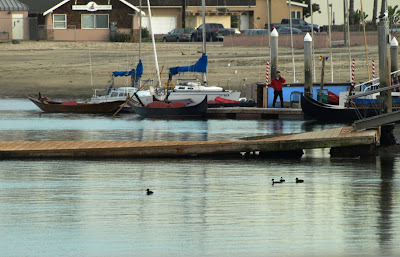 Just the Photo - "Gondola Docks in Alamitos Bay"
Joe Gibbons sent me this one. With the colder months upon us, I'm not surprised to see photos of snow on gondolas these days. I must say that this photo's got me questioning the whole "global warming" thing. Many thanks to those in Las Vegas who were so hospitable - I'd love to have spent more time with you all but I had to get back home. I've got some painting to do before "V-Day"...and I've got to do some serious re-hydrating! The boats that inhabit the canals and lagoon of the only Las Vegas casino themed around Venice, were all built to order by Treadway Industries. Treadway had already been contracted to handle much of the architectural theming (making a normal building look Roman, Greek, Egyptian, etc). When they were asked to bid on the boatbuilding project, it was an easy extra for them. The finished product was a result of much deliberation over the best design, because once they chose a design and built the moulds, the only changes possible would be to the accessories and non-fiberglass parts. 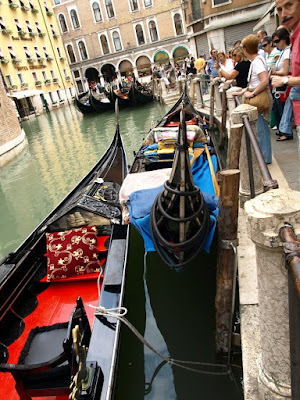 Yes, the gondolas are fiberglass, but not just any old "tupperware" boat material - the vacuum-bag construction method used was top of the line and state-of-the-art. Ultra high-quality foam core and fiberglass materials were used, and the guy who headed up the building project was reportedly known to have built racing sailboats that competed in the Americas Cup competition. Suffice to say, the gondolas were built on a budget that you might expect at a major Las Vegas casino. The proprietor of said casino was new to the game and wanted to put his best foot forward - he spared no effort or expense and it shows, not only in the boats but in the resort as a whole. Christmas decorations adorn a gondola moored along the canal. I had the opportunity to tour the Treadway facility during the construction of some of these gondolas. It was incredible, really amazing to see such high quality work being done on such a large scale. Around two dozen of these boats were produced there. By the time I walked through the facility, some had already begun cruising at the casino, but there were others - stored and waiting in a room. I walked into that room, and the best way to describe it, would be that it was like walking into the showroom of a luxury car dealership. There they were, all black and shiny - the glossy gel-coat was like no paint on the market, surfaces reflected like black chrome. The wood trim on each boat was stained a little different than the others, and the seating upholstery colors varied as well. 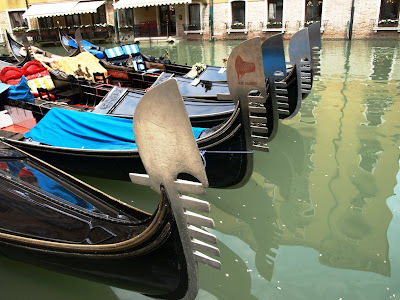 I realize that some who read this find non-Venice-built gondolas to be objectionable, but these gondolas are like no others on the planet (except their sister ships that operate in the casino's counterpart in the Orient). Treadway no longer builds gondolas, the contract to build them for the casino in Las Vegas was a limited one, and the moulds and designs used to build them are the property of the casino, not Treadway. I know this because the reason I visited Treadway was to hire them to build boats for one of my operations - they were thrilled with the idea, the owner of the moulds was not. 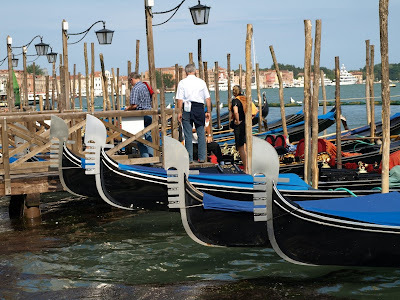 It's easy to criticize the gondoliers who operate thes boats, but one must remember that they are simply doing a job in the manner that it was designed to be done. For whatever reason, the people who designed the casino waterways felt that a smaller boat which was motorized would serve their needs better than gondolas of traditional design and propulsion. I'm not here to cast judgement, just report the facts. The boats are roughly twenty-five feet long, and their remi are used as rudders more than rowing gear. The boats are pushed through the water using electric motors which are hard-mounted beneath the boats. On-board chargers are plugged in each night when a boat is wrapped for the night, and the ones operating in the outside lagoon also have protective canvas pieces for the seating areas. The hull design looks like it's round, but just below the waterline the bottom is flat making the vessel more stable. These boats are wide, probably five feet or beamier at the widest point. When compared to the genuine article from Venice, their bow decks are bigger and don't have quite the A-shaped cathedral, but they do catch the eye nicely. One thing that Treadway did which was an original element for a gondola, was the use of varnished wood as both trim and to frame the seating area. I believe that oak was used on all the boats, again, with different stains used to give a variety of tones within the fleet. Whether you're a purist or a more progressive gondola fanatic, if you haven't seen this operation yet, you really ought to. I guarantee you'll experience a wide range of emotions, and you'll want to take pictures and video. I just wish I'd brought my camera back when I visited Treadway. 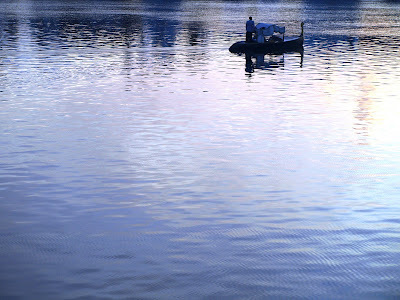 Just the Photo - "Calm Water on Lake Las Vegas"
I spent some more quality time today in Nevada's own version of Venezia. 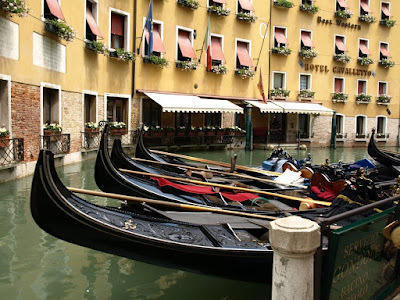 I took some more photos and video, and had a great ride on one of the gondolas with a terrific gondoliera. I grabbed this shot on my way out the front door of the casino. A while back I mentioned in a post that a small group of red and white striped poles in Venice have inspired more mimicry than any of the other palina patterns - here's living proof...in the Nevada desert. As for the campanile, she's a pretty convincing recreation. If it weren't for the big high-rise in the distance you'd think it was Venice. Hmmm, then again, I don't think we'll ever find the real campanile that close to the Rialto! Shot in the morning at Lake Las Vegas. Just the Photo - "Casinos and Campanile"
Rowing in a Santa Costume?